It can be pretty frustrating if each time you go to access your closet, you pull on the sliding door only to have it fall off its track or have to force it to move because it’s hanging crooked and scraping along the floor. Sometimes, the panels won’t budge at all because they’re jammed or just completely off their tracks. These bypass style sliding closet doors are a simple design, and as such, are fairly easy to fix. The key is having the hardware in working order or the “right” sliding closet door hardware if you need to replace any parts to get your closet doors working properly again. Along with showing you which parts to use, we’ll give you the low-down on how to make this DIY fix glide smoothly…for you and your closet door. Check out the following sliding closet door symptoms and then follow a fix that best fits the problems you have. The first thing to check is what type of rail system your sliding closet door uses in order for it to slide. If your doors hang from a top rail and do not have a track on the floor, then you need to either replace or tighten down the floor guides. See if the screws holding the guides down need tightening to be more secure. If the hole where the screw goes in appears to be stripped, you can move the guide over an inch and drill in a new hole. If the guide itself has broken or is bent (and not keeping the door in place as it slides), then you’ll need to buy a new floor guide part and screw it down. Just take out your old part and match it at the store. 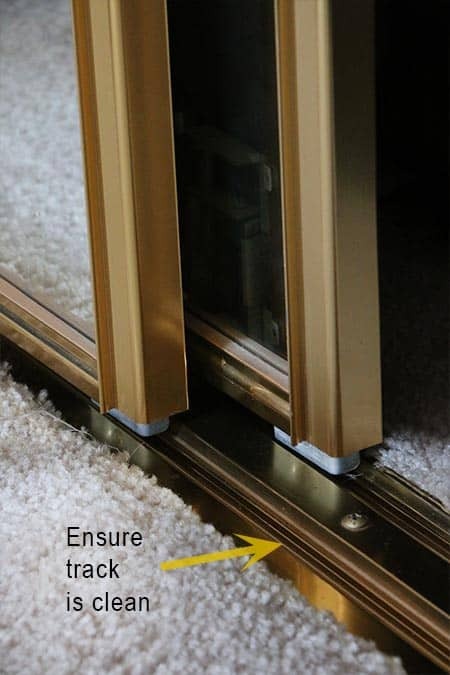 Your sliding closet doors may have tracks secured to the floor and be guided by a top rail. If one side of your door is loose, then it’s most likely that a wheel or wheel brace is faulty. Take a look and ensure the entire wheel is in one piece and properly seated in the track. First, check the alignment of your closet doors. Stand back five feet or so and examine the gaps on the top and bottom. There should be an even and uniform separation all the way along the top and bottom. If you see an uneven gap, it will require you to raise or lower one of the sides. You can then fix the problem of your closet doors jumping off their track. Depending on your door type, locate the brace that holds the wheel (roller) on the side that is sagging. Using a screwdriver, you can just adjust the mounting screw. Don’t worry, it’ll be the only screw you see there. You can adjust it by turning the screw clock-wise until the side of the door raises up on its own, making the gap even. Your brace may be the type that doesn’t have this one mounting screw. If this is the case, you’ll have to manually move the brace and wheel assembly with your hand to get into position before tightening up to two small screws attached to the inside of the door. If the above doesn’t fix the alignment or door hopping off the track, it is probably time to replace the wheel mechanism altogether. You may notice that a wheel is broken or it’s brace is bent. This will be an obvious sign that you need a new part. Another culprit to this problem is a dirty or bent track. Inspect your sliding closet door track and either vacuum or brush out any debris, gunk or dirty in there. Carpet fibers and dust are the most common. If heavy objects have been moved in and out of the closet, the metal track may have been damaged, and not providing a smooth, even guide for the wheel to roll along. If damage is minor, you can usually shape it back to normal. Try placing a length of wood block into the track, up against the bend. Then, hammer the metal against the wood (holding it down by standing on it). Using some of the tips above, inspect the closet door rolers and their braces. Tighten things down after you’ve ensured the doors are level. When in doubt, replace any parts that are damaged, i.e. pieces missing or that have chips and bends. You’ll be much happier with a new part versus trying to save some time fixing hardware that you need to retire. Jams can also be caused by damaged or dirty tracks. Follow the above for fixes. Remember, if you have mirrored or solid wood sliding closet doors, be careful when handling and adjusting, as these doors are heavier than you think. Also, most wheels and rollers are plastic or nylon and don’t generally need lubrication, but must be kept clean and free of debris for them to move freely and smoothly along their tracks – which is exactly what you want!